Black Hat Miniatures is re-releasing the Unfeasibly Miniatures Exotic Adventures range of miniatures, perfect for some historical or pulp action. We are very pleased to say that we are now producing the Unfeasibly Miniatures 28mm Exotic Adventures Range under license. The range depicts the French Foreign Legion at the turn of the 19th Century in Northern Africa, immortalised in the stories of Beau Geste by P.C. Wren. The range includes Tauregs, who resisted the French colonial invasion of their Central Saharan homelands. We have two more packs of Legionnaires with improvised weapons which will be released as soon as production moulds have been made. Mark at Unfeasibly has plans to expand on the range to add mounted troops. Black Hat Miniatures is offering free shipping on all UK orders for paint during the month of December. Black Hat Miniatures has posted their updated policy for shipping paint in lieu of the new rules for the Royal Mail. Royal Mail rules on sending water-based paints have changed and no more than four containers of up to 150ml each can be sent in one parcel, whether in the UK or internationally. That means we must break down orders for paints into groups of four and send each group separately in order to comply with the law. The shipping charges have been changed to allow you to select Royal Mail shipping for 4 pots or less. This applies in the Uk or internationally. In the UK for more than 4 pots please select 5-8 pots UK (which will be sent in two parcels) or UK Courier. 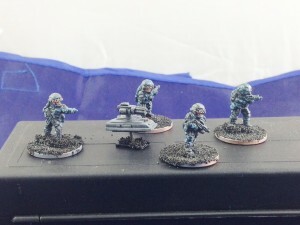 Armies Army has some new 15mm sci-fi alien minis available over in their webshop. ArmiesArmy are proud to release the first pack of my 15mm enemy Uknown The K'Zisla empire . The pack consists of 10 unique infantry figures and 2 plastic shields. The infantry consist of 2 fire team leaders, 4 riflemen, two heavy weapons and two force shield bearers. Each pack will cost £3.75 GBP and are available from the very fine Black Hat Miniatures Web store. ArmiesArmy now has their 15mm Neo-Chinese figures available for sale. Go pick up some mini-little mans now. ArmiesArmy are proud to release the first pack of my 15mm Neo Chinese Forces. The pack consists of 8 unique infantry figures and two Gun Drones. The infantry consist of 2 fire team leaders and 6 riflemen, two of which also have UGL's. The two part gun drones contain hover drone and Gatling gun weapon. 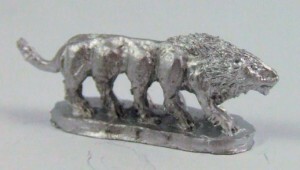 Each pack will cost £4.00 GBP and are available from the very fine BlackHat Miniatures Web store. Black Hat Miniatures has their latest 15mm Sikh Wars releases available now over in their webshop. Packs are 10 infantry/5 cavalry or 5 infantry/3 cavalry command. The civilian packs contain 8 unique sculpts. Next release will be the Afghan Tribesmen and then the Native light and Irregular horse for the British. Black Hat Miniatures released their French WWI Halflings, that had been successfully funded via Kickstarter, over in their webshop. Black Hat Miniatures has new 15mm Sikh Wars models available to pre-order as well as a list of what they hope to have available in time for Salute. Our new 15mm Sikh Wars range is now available for preorder on the Black Hat shop. I will be adding photographs as I get production moulds made of the figures (the cavalry arrived this morning). It has taken longer to get the cavalry done than expected, so there are a number packs still to come but we have a healthy chunk in this release. I have listed every pack I am expecting to have done in time for Salute, with the extra packs coming in May/June. Black Hat Miniatures is headed to Salute and is willing to bring along your order with them to help save on shipping if you just want to pick up your toy soldiers at the show. We will be at the Salute wargames show at Excel on the 20th April on stand TM03. As usual, we are not able to bring all our ranges to shows as there are simply too many. So PLEASE preorder anything you really want to avoid being disappointed on the day. I will be putting up the new 15mm Sikh Wars range for preorder next week. We are also offering a 10% discount on Coat D'arms paints preordered for the show and paid for in cash on the day. Simply order through the shop and select Cash on Delivery as payment and Collect at Show for delivery. We will knock off 10% on the day. Or you can email or phone through orders for collection - paints or miniatures! 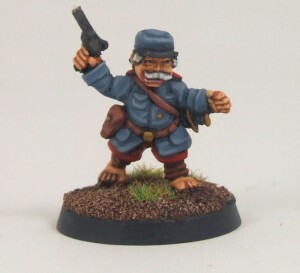 Black Hat Miniatures got a painted-up squad of their new French WWI Halflings and is showing them off. This is the initial full squad of 9 halflings for our Kickstarter painted by Jez at Shakespeare Studios. Still has 9 days to go! Black Hat Miniatures is half way to their halflings (would that make them currently quarterlings?). Anyway, plenty of time to still get there. The Kickstarter project launched by Black Hat Miniatures to produce a range of WW1 French Halflings has reached half its funding target. The project has been updated with painted images of the figures and you can now add-on figures from the existing WW1 German Goblin range to your pledge. Still 19 days to go, so plenty of time to sign up and get the project to its target. Black hat Miniatures has started up a Kickstarter in order to fund a new line of WWI French Halfling soldiers. 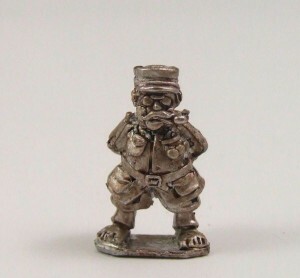 We aim to produce a range of 28mm WW1 French Halflings to provide opposition to our existing WW1 German Goblins. 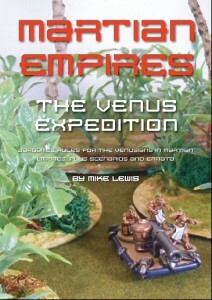 Black Hat Miniatures released their Venus supplement for Martian Empires, and it can be downloaded, for free, right from their website. The supplement for the Martian Empires fastplay Victorian Science Fiction Rules is now available as a free PDF. The supplement covers the Lizardmen forces list, some scenarios and contains updated lists and an FAQ for the Martian Empires rules. Black Hat Miniatures adds to their sci-fi line with their new Martian Lion. We have one new pack for the 18mm Martian Empires range which is an addition to the Martian Fauna – a 10-legged Martian lion. Black Hat Miniatures adds to their 15mm line with two new releases. Black Hat Miniatures released their new Great Abhor model over in their webstore. We finally have the Great Abhor model for CObalt-1 SF available. This is a resin and metal kit and stands 60mm to top of its head. This pack contains one Great Abhor Model. This is a resin and metal kit. Black Hat Miniatures has their new Minnow Submarine available in their online shop. It's a yellow submarine... and we all live in it? Minnow Submarine, comes with a metal conning tower, plus bubble trail. Black Hat Miniatures just released some WWI-inspired Goblin Infantry. Go have a look-see. We have recently purchased a range of WW1 Fantasy Goblins from Frank Hammond which had a limited release through Goblin Garrison. These are now available in the Black Hat shop and we have been able to reduce the price of most of the figures by 20%. We have now released the Prussian Steam Tanks for our 18mm Martian Empires Victorian Science Fiction range. They are both resin and metal kits. The Heavy tank comes with the option of 2 long guns and 2 short guns enabling to choose how to arm it. Black Hat Miniatures have re-released the Cobalt-1 sci-fi miniature range, sculpted by industry veteran Bob Naismith. Play Unplugged examines the range and discusses some of the many uses for this unique line of figures. Due to a cataract operation, we will be closed for 2 week from mid-June. Orders can still be placed but will be processed slowly from that second week onwards. 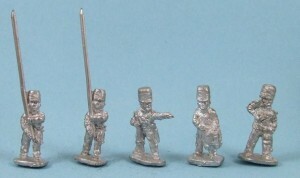 Just a heads up that I have added the old Green-Eyed Minis 15mm Sf figures to the Black Hat shop. They will form the basis of a new release for Martian Empires later in the year, but I have been asked by a number of people about them recently, so I thought I'd let people buy them if they wanted to. These all come as 4-part kits. Glossy sets of these figures will be released over the next couple of months. The releases for Salute are now up for pre-order in the online shop. Also added 3 more characters, an Ygrainne assault troopers pack and new accessories packs for those wanting helmets and backpacks separately.